So, Premier League fans, ready for your fix of football for the day? Presenting the second installment of ‘A Drug Called Winning’. Read On! Look away, Chelsea fans. Jose Mourinho has begun his career with Manchester United. And in a rather splendid way. Even if it was against lowly Bournemouth, the manner of winning must be quite a welcome sight to the fans who have been waiting for the glory days since Sir Alex left Old Trafford. A first half that was typical of familiar Mourinho style, with the defence heavily parked and the players coming out to attack only rarely, the second half performance was much more glamorous. It was Juan Mata who opened the scoring just before half time, getting a rare start under the Portuguese, after a couple of horrendous mistakes from the Bournemouth defenders. Martial was the architect of the second, whose mishit half-volley following a Valencia delivery resulted in a perfect set up for a Wayne Rooney who nodded the ball in with perfection. Around the 65 th minute, Ibrahimovich who had had a quiet debut till then, snatched another martial pass and fired from over 30 yards out, quelling all hopes of any comeback from the cherries. Although the men in red and black managed to pull one back thanks to Adam Smith’s unstoppable left foot, Mourinho’s men managed to avoid further hiccups and capped off a satisfying win on their opening fixture. New signing Mkhitaryan came on only as substitute while Paul Pogba, after creating unbelievable hype and hope was rendered unable to play because of a carry-over suspension from the Coppa Italia. With the side already looking strong enough, it is going to be interesting to see how Mourinho goes about his squad selection now. Glory Glory, Manchester United. Just one week into the season and we already have a match of the season contender. Liverpool emerge winners after the brawl at Emirates stadium, and the Arsenal faithful have already started dissing Wenger’s transfer policy. It was the gunners who drew first blood, with Moreno bringing down Walcott foolishly inside the box. Despite Mignolet stepping up and saving the penalty, it took merely one minute to take the lead through Walcott, Moreno again making the mistake that lead to the goal. Just around half time, the reds equalised courtesy a picture perfect free kick from Coutinho. After the game resumed, Liverpool took the game by the scruff of its neck, with Lallana, Coutinho and new man Mane scoring in quick succession within a matter of 15 minutes. With the introduction of Santi Cazorla however, Arsenal found a new found spark in midfield and 3 minutes in, the Spaniard turning provider, first for Oxlade Chamberlain and then for defender Chambers. With 15 minutes left to go, it was all Arsenal as they sent in wave after wave of attacks to find that elusive equalizer. 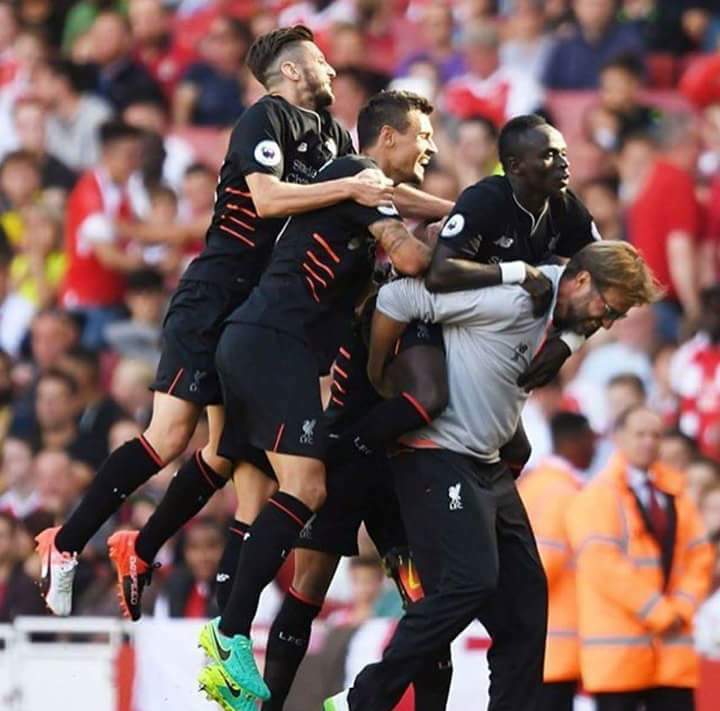 But the men in red held on for their life, rigidly organized and defensively efficient, marking Jurgen Klopp’s first win as full time manager at the Kop. With Arsenal fans already disheartened at the lack of new strikers brought in during the transfer window, the cry became even louder with such a disappointing defensive performance. Although Wenger could blame it injuries to his usual Centre backs, calls for “Wenger out” will not subside unless he splashes some serious cash to get a world class striker this season. Antonio Conte – Better known as “the godfather” in Italy. We frankly don’t know what offer he made to the blues, but they sure accepted it. Far from the debacle of last season, Chelsea look invigorated and suprisingly agile. The greatest improvement is really Diego Costa, the Brazilian born striker looking like a total beast under this new system. West Ham, who finished 7 th last season was given better odds at defeating the men from the bridge. But under the combined effort of some very poor play by the hammers as well as a Chelsea that has never looked as threatening and offensive in the recent past, West Ham were pretty much on the back foot the entirety of the match. Chelsea took the lead in the 46 th minute through an Eden Hazard penalty, after Azpilicueta was brought down in the opposition box. Until then and about 25 minutes after that, it was Chelsea all the way as West Ham were not even offered the luxury of possession. However, once Dimitri Payet came on, there was a shift in momentum and the tired Chelsea defenders allowed too much space in the flanks. As feared the equaliser came in the 77 th minute, after a corner from Payet and some mix up which was pounced upon by Collins leading to an unstoppable shot. Just when it looked like Conte had to make do with a solitary point, Costa who had had a brilliant match, turned saviour, driving in a ball from outside the box to the bottom left hand corner. 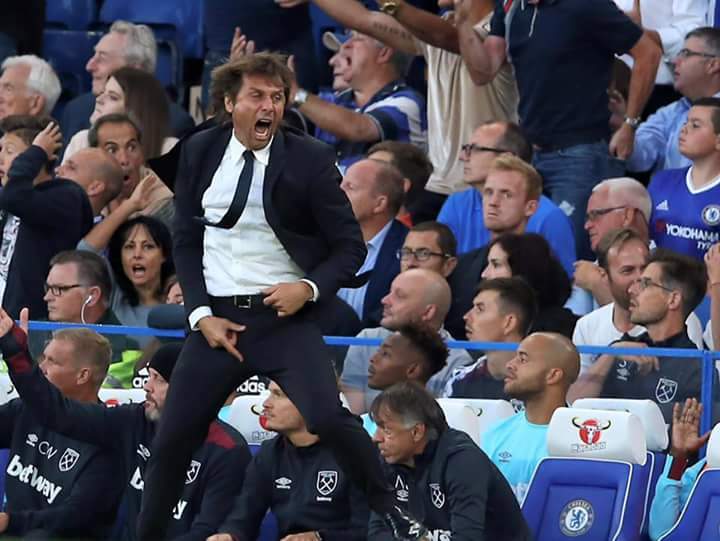 The moment of the match definitely was Antonio Conte’s wild celebrations following the winner. Pure ecstasy. Pure passion. For the people who had never seen what Conte’s tactics would be, this was a demonstration of the finest quality. If not for that unexpected goal, this could very well have been considered a defensive masterclass, with brilliance in attacking play. This is going to be one hell of a season. This entry was posted in A Drug Called Winning, General. Bookmark the permalink.